Apart from the frames found within the application, hundreds more are available for download at the Online Frame Gallery. Impress your loved ones with frames from multiple categories: Classical, Shapes, Emotions, Occasions, Seasons, Sports, Locations, Music, Family and much more! Send framed images as e-Cards (via email) or use our free e-Cards online service on any occasion or event. 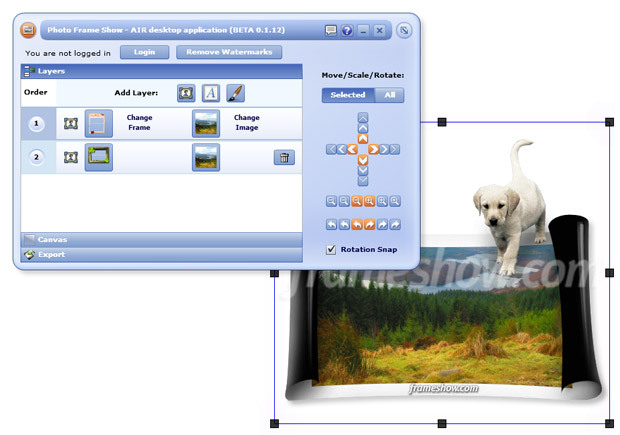 Qweas is providing links to Photo Frame Show 1.0.16 as a courtesy, and makes no representations regarding Photo Frame Show or any other applications or any information related thereto. Any questions, complaints or claims regarding this application Photo Frame Show 1.0.16 must be directed to the appropriate software vendor. You may click the publisher link of Photo Frame Show on the top of this page to get more details about the vendor.